Come along and see our brand new Leafcutter Ant Exhibit. The bespoke enclosure features a long tunnel housing around 3000 Atta Cephalotes where you can see the ants at work and feeding. Atta cephalotes are originally from the rainforests of Trinidad. Leafcutter Ants of both species are ruled by a single queen. Every single ant in the colony is a female. The ants all have roles, some tend eggs, others cut leaves, some remove rubbish and soldiers guard the colony. Leafcutter ants travel some distance to collect leaves to take back to the nest. They then chew it, spit it out and vomit on it to promote fungus growth. The fungus is what they eat. Leaf cutting termites and humans are the only other animals to grow their own food and as such Leafcutter ants are farmers. The Leafcutter Ants are fascinating to watch as they march through the see-through tunnel to carry leaves. Learn some fascinating facts about these amazing insects; for instance, Ants are able to carry loads exceeding 10 times their own body weight. Next to humans, Leafcutter Ants form the largest and most complex animal societies on Earth. All the workers are female; males are only produced when creating new colonies. Male and female flying Ants leave the nest once a year and when the females lose their wings and become Queens, the males die! The Queen is the size of a large Bumble Bee and is enveloped in the Fungus garden where, quite rightly, she is tended to by her tiny workers! 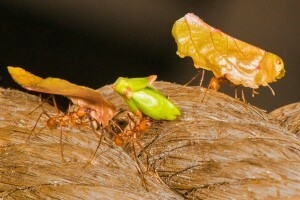 Some Ants hitch a ride back on the leaves being carried, acting as guards against parasitic flies. Ants don’t eat the leaves but pass them on to specialist workers who mulch them into the fungus….it is the fungus the Ants feed on. Ants travel by following pheromones; just 1 gram of this pheromone is enough to lay a trail around the world!